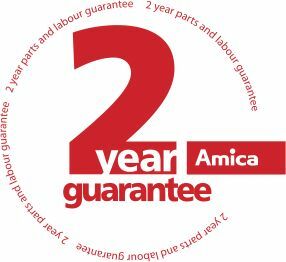 Your Amica product is covered by guarantee for 24 months from the date of the original purchase. Please ensure you register your product and keep your receipt (proof of purchase) and serial number in a safe place. You can register your Amica product either online at www.amica-international.co.uk or by calling 01949 862 012 (UK) or online at www.amica.ie (Ireland). Should you discover a fault with your Amica appliance, no problem. Request a repair under guarantee by filling in the form on our contact us page, call on 01949 862 012 or email service@amica-international.co.uk. We’ll send one of our expert technicians to repair your home or kitchen appliance, free of charge. Labour costs of an approved Amica engineer. A service charge could be made if a fault is not a mechanical or electrical manufacturing fault. This guarantee does not in any way diminish your statutory or legal rights.